This high temperature, heat resistant and radiant heat reflective sleeve can be used to protect industrial wires, cables, hoses (hydraulics), piping and tubing from radiant heat sources such as glowing steel slab, liquid metal pour stream, infrared heaters and other similar sources. 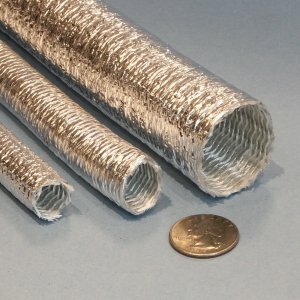 This aluminized PET film coated fiberglass sleeve slides easily over wires, cables and hoses. Made from a high-bulk high insulation value convoluted fiberglass sleeve. This aluminized sleeve reflects more than 95% of the radiant energy that hits its surface, keeping the underlying cables, hoses and wires cool. Available in sizes from 1/2" through 2.5" ID, the sections are produced in a 4 foot length. This sleeve is also used extensively for automotive and truck under-hood engine compartment applications. PET filaments are inter-woven with the fiberglass substrate to form a sleeve that resists crushing and actively resists compression, thereby maintaining its round shape during installation.